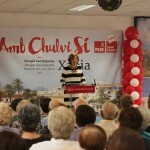 The Xàbia PSOE began their campaign events with two rallies on the same day: the Arenal in the morning and in the Pueblo Social Centre in the afternoon. 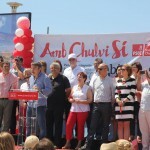 The mayor and PSOE candidate, José Chulvi, pledged to insist that the Generalitat, “no matter who governs” fulfils its signed commitment to build a municipal swimming pool. 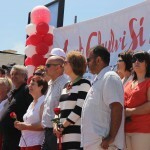 The speeches were conducted in Castellano, Valenciano, English, Dutch and German. 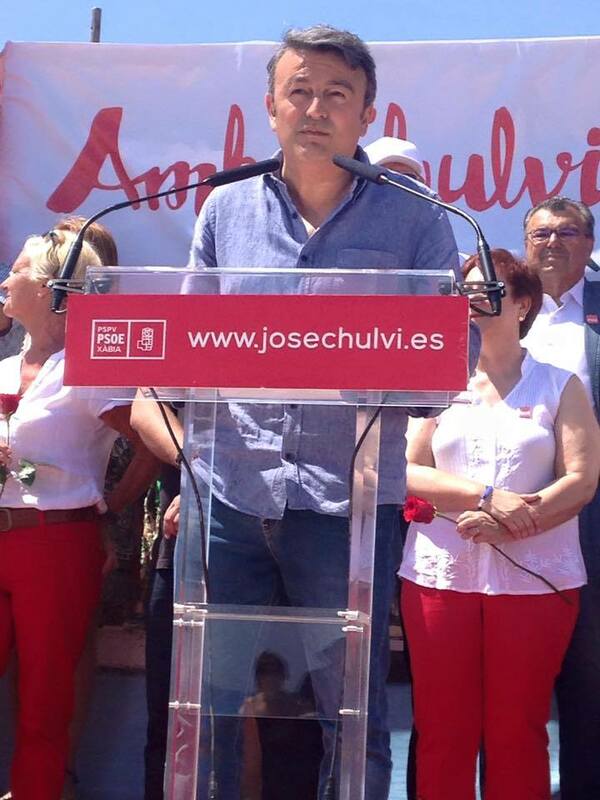 In addition to José Chulvi; both Isabel Bolufer, number 2 on the candidate list, and PSOE president George Thomas gave speeches. 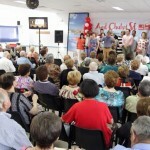 Both events attracted a large attendance. 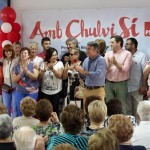 On Sunday the Xàbia PSOE began the electoral campaign with two rallies, one on the Paseo del Arenal in the morning, and another in the afternoon in the Social Centre, in the presence of over a hundred representatives of retired citizens. 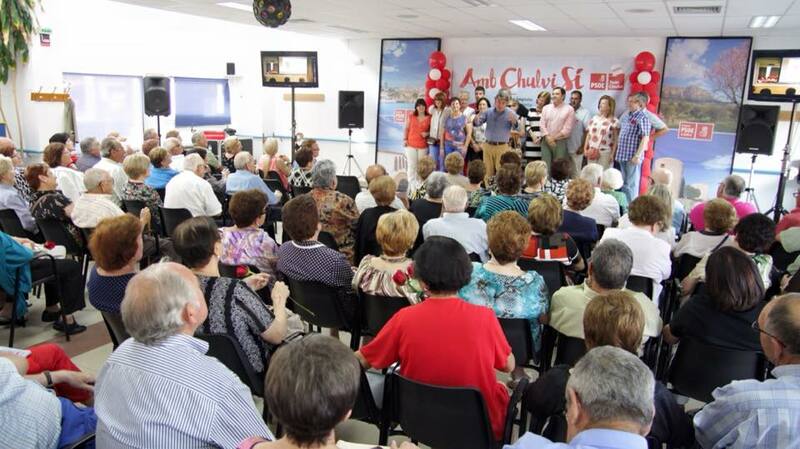 In both meetings the mayor and candidate for re-election, José Chulvi, took stock of the legislature that is just ending; during which more than 95% of the 2011 electoral program was completed – in addition to many other projects which were not included in the programme, but were a response to the real needs of the town, such as improved coverage by social services, and the creation of employment boards – he then presented the key points of the new programme. 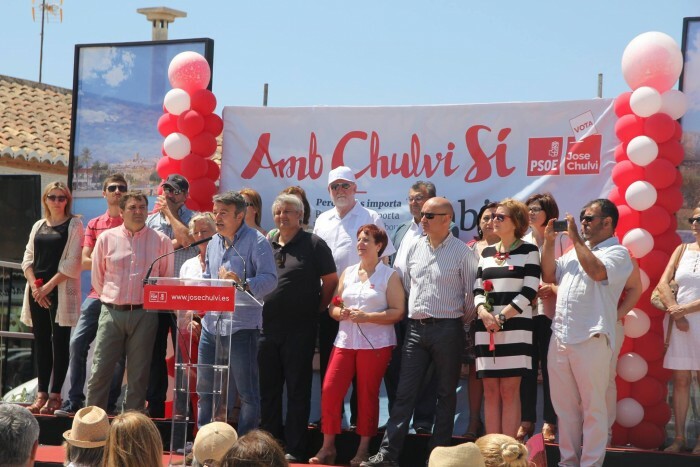 Of the key outstanding issues there are two clear objectives of the PSOE which need to be freed up for the benefit of Xàbia; the Montañar walkway and the municipal swimming pool. The first, explained Isabel Bolufer, will be during the next legislature, ” with a project which will have the maximum consensus, and be respectful of the environment and landscape.” In this regard, she stated that this area of ​​the bay of Xàbia is one of the most emblematic for both residents and visitors, and that the infrastructure must be compatible with the natural characteristics of the area. Bolufer was convinced that the PSOE will be able to reach the necessary agreement with the other parties in the Town Hall, to carry out this work. With regard to the swimming pool, this is one of the most controversial issues and is gaining increasing awareness on the public agenda of Xàbia. She reminded everyone that the Generalitat Valenciano has breached its agreement to provide Xàbia with a municipal swimming pool in exchange for the town constructing a new ‘trinquete’ court. Now the Socialists have set this as an objective to demand that the Valencian government comply with this agreement “by all legal means necessary, and irrespective of who governs in Valencia from May 24”. 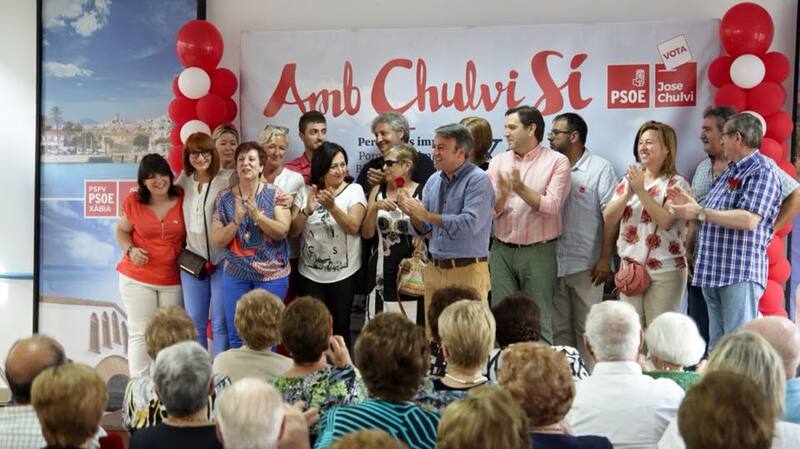 Both José Chulvi and Isabel Bolufer agreed that the formula of “small urban works” will be the keystone of the PSOE government should they achieve an electoral victory. The main candidates totally reject the idea of ‘mega-projects’ and defended their proposals “in which public works will meet the needs of all residents, making life easier for all, respecting our idea of a model town, and generating wealth and jobs in Xàbia “explained Bolufer. This included such works as the repairing and resurfacing of more than 40 kilometres of roads, improved street lighting, the opening of new public areas such as parks and squares, renovating avenues, the Paseo del Arenal, the planned renovation of the Central Cinema, the new bus station, the opening of the Via Augusta and restoring the La Plana windmills, the lime kilns and the Arnauda riurau ​​among others. 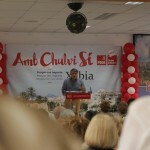 As for the Arenal area, José Chulvi presented the renovations of the ‘Paseo del tenista David Ferrer’ as an effective act “improving the touristic heart of Xàbia; the first thing visitors see when they arrive.” He recalled that his government “has invested more for the wellbeing of the residents, the restaurant trade and businesses located here, than occurred in the last 20 years.” In line with his model for tourism, the mayor stressed that this sector should remain the economic driver of the town, but not in an uncontrolled way. “Xàbia is not just another anonymous destination for sun and beach,” said José Chulvi, “we have our own personality which makes us attractive, combined with our natural, social and cultural heritage which we must preserve as our greatest asset.” Additionally, he said, the goal is not so much to attract new tourists, but new residents who choose to live and integrate themselves in Xàbia; and also to extend the concepts of wellbeing and quality of life for everyone throughout the year. 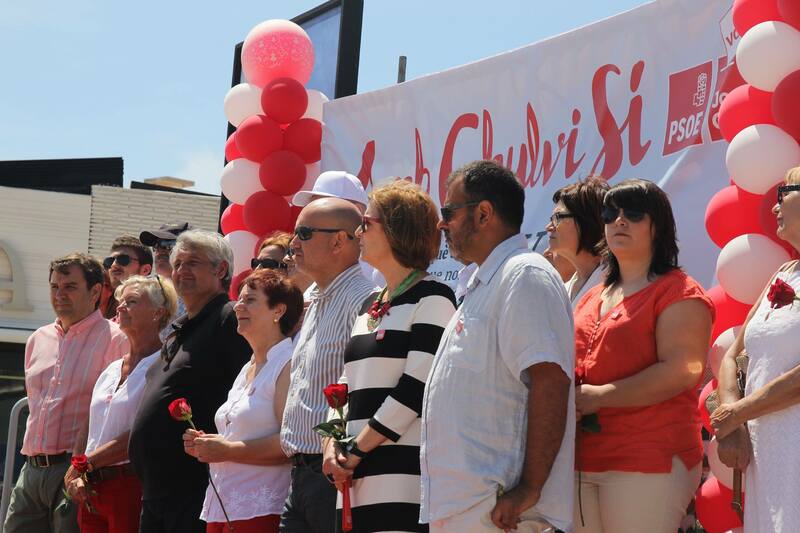 The mayor and candidate, José Chulvi, presented the change of style in Xàbia politics as one of the most notable successes of this period. He noted that since the change of government in 2011, Xàbia Town Hall “is more transparent, flexible and effective; having opened channels of communication with all citizens in Castellano, Valenciano and English and have launched channels for participation through citizen councils.” This change also improved the cooperation between the political parties. Chulvi mentioned that during these four years some major decisions were included which were not just attributed to PSOE councillors and their government partners, but also to the opposition councillors. “During this time we have sought greater consensus for the sake of Xàbia. Because of this you will never hear me say that I have done something just by myself. That would be less than the truth. Anyone who personally claims to be responsible for the success of municipal management is less than truthful. Supermen do not exist “. Another aspect that stands out is the change of priorities in political action; Isabel Bolufer explained that in 2011 the government team found itself with a budget of 8 million euros less than the previous year. Despite this, it was decided that social services would not suffer any cuts, but would be increased so that no citizen in serious difficulties would be unprotected. This was made possible, among other things, thanks to the savings gained from José Chulvi’s decision not to accept any salary as mayor of Xàbia. In the next election Xàbia will decide its future for the next 20 years. 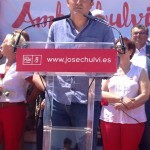 This has been one of the central ideas of the socialist’s speech at the start of campaign; according to José Chulvi “who the citizens vote for on May 24th will affect the type of town that we will leave to our children and grandchildren.” The PSOE candidate referred to the danger of returning to the old economic formulas of construction, and demolishing all the work of harmonisation, protection and consensus which has been achieved during this period. 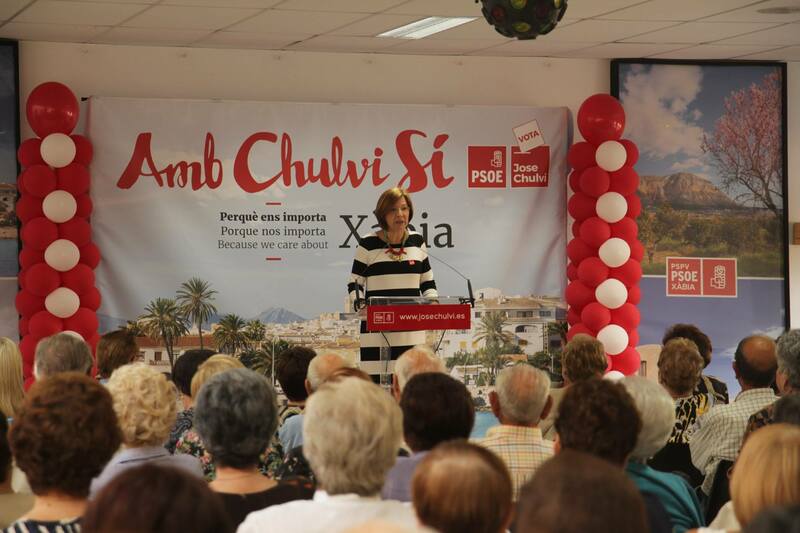 Chulvi said that it is possible “to continue to grow and prosper” maintaining respect for the natural environment of Xàbia and its identity, and warned of a possible return to speculative construction developments in our area. 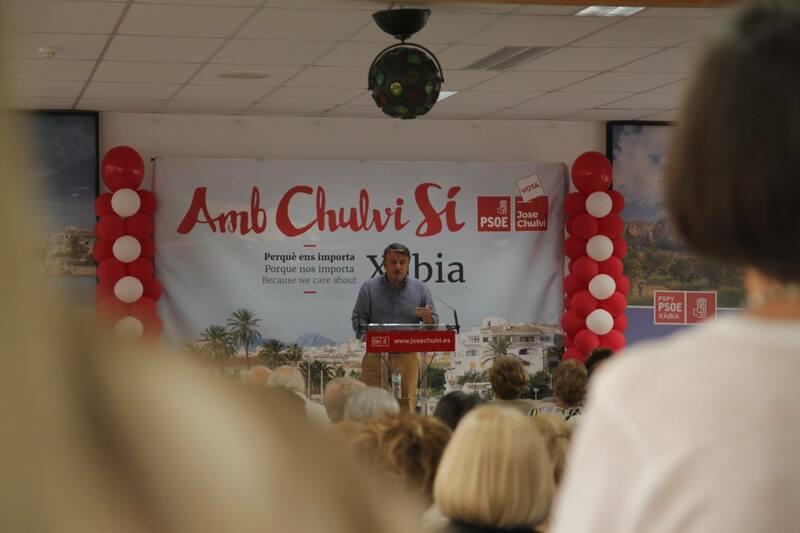 He also said that the main objective of the Xàbia PSOE is to continue with a management “which is positive, non-confrontational and not personalised” which unfortunately has become the benchmark in Valencia. Proof of this is that the 2011 legislature is the first in many years that ends without traumatic changes in the composition of the government or controversial projects that cause great division in Xàbia.